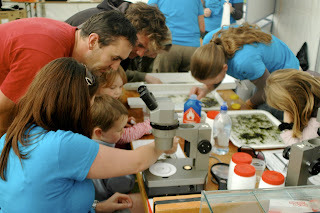 ecoLincNZ: BioBlitz Lincoln 2009: 1637 species in 24 hours! At 3.15pm on the Friday, Selwyn district councillor Lindsay Philps welcomed the crowd and New Zealand's famous bugman, Ruud Kleinpaste, kicked it off with an inspirational speech about biodiversity before stripping off his top to reveal his Bioblitz t-shirt underneath. The 24 hour countdown had begun. 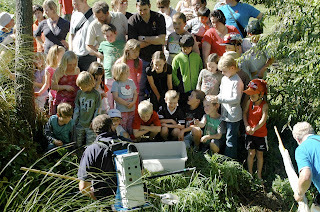 Swarms of primary school children ran to the first scheduled event with Ruud, collecting invertebrates. Vials were given to all willing participants and children were soon collecting invertebrates and running back to base camp to get the scientists to identify their bugs. The line was long but enthusiasm was high. From this point, base camp was a hive of activity. 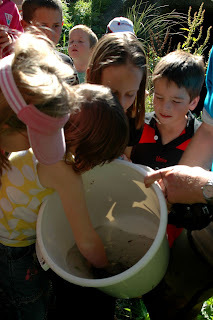 Displays of Canterbury mudfish, aquatic invertebrates, weta and more were scattered around the marquee for the public to see while biologists got to work as the specimens poured in. 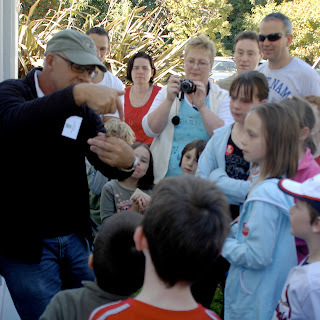 Water testing, lizard, plant and bird walks, mammal tracking and many more activities were offered throughout the event. These were popular, especially the mammal spotting at night led by Lincoln University's James Ross. 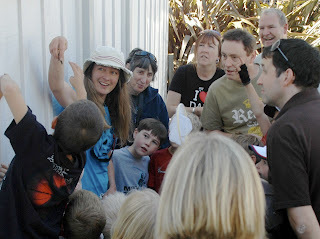 There were so many children on this walk that it was too noisy to spot anything so they had to go out again! Table 1. The number of species counted at the BioBlitz Lincoln 2009, separated by groups of taxa and, for those species known, how many are endemic (found nowhere else in the world but New Zealand), non-endemic indigenous species (also native elsewhere), and introduced exotic species. The count in the "All" column is often more than the sum of the previous columns because it includes species where status has yet to be determined.